Thinking of buying or selling a home or property in Brick, New Jersey? Let Daunno Realty’s team of Realtors help! Please contact us today. For more information about Brick, NJ please see the information below. Brick Township (also commonly known as Bricktown or Brick) is a township in Ocean County, New Jersey, United States. As of the 2010 United States Census, the township had a population of 75,072, making it the state’s 13th-largest municipality and the third most populous municipality in Ocean County (behind Lakewood Township and Toms River Township), having seen a decline of 1,047 residents (-1.4%) from its population of 76,119 in the 2000 Census, when it was the state’s 12th most-populous municipality. While the majority of Brick Township is located on the mainland, Ocean Beaches I, II and III are situated on the Barnegat Peninsula, a long, narrow barrier peninsula that separates Barnegat Bay from the Atlantic Ocean. The mainland and beach area of the town are not geographically adjacent. Brick Township was incorporated as a township by an act of the New Jersey Legislature on February 15, 1850, from portions of both Dover Township (now Toms River Township) and Howell Township. The township was named after Joseph Brick, the owner of Bergen Iron Works located on the Metedeconk River. Portions of the township were taken to form Point Pleasant Beach (May 18, 1886), Bay Head (June 15, 1886), Lakewood Township (March 23, 1892), Mantoloking (April 10, 1911) and Point Pleasant (April 21, 1920). In 1963, voters rejected a referendum that would have changed the township’s name to “Laurelton”. After hovering for years in the top five, in 2006, the township earned the title of “America’s Safest City”, out of 371 cities included nationwide in the 13th annual Morgan Quitno survey. 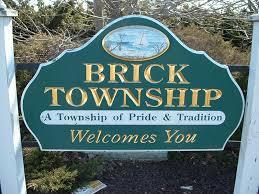 Since the year 2000, Brick Township has been the safest “city” (population over 75,000) in New Jersey. In 2003 and 2004, Brick Township was ranked as the second safest city in the United States, after Newton, Massachusetts. In 2005, Brick Township had dropped down to the fifth safest “city” (population over 75,000) in the United States, before it rebounded to the top in 2006. In 2009, Brick Township ranked No. 6 on Newsmax magazine’s list of the “Top 25 Most Uniquely American Cities and Towns,” a piece written by current CBS News travel editor Peter Greenberg. In determining his ranking, Greenberg cited Brick’s consistent nod as a safe city and that its “commercial development of big-box stores, department stores, and chain restaurants has made it a shopping destination for much of northern Ocean County.